A lifelong appreciation of the outdoors and deep love of solving puzzles put Whitney Ciani on the path to becoming a Geotechnical Engineer. So, what does she do? In short, she makes sure the ground is safe for people to build on. 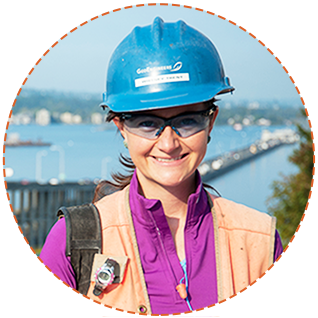 Today, she works as a lead engineer on projects such as the Award Winning SR 520 Floating Bridge, the longest floating bridge in the world! "Give yourself the time and patience to get to where you need to go. Changes in your path are not roadblocks. Maybe you’re going in a different direction but that doesn’t mean you’re not going to love where you end up." Whitney knows there are a lot of organizations that want to support you and she encourages young people to apply for scholarships as much as they can!